YOKOHAMA, Japan -- Nissan Motor Co. has developed a new kind of fuel cell drivetrain for cars that taps an onboard tank of ethanol instead of pressurized hydrogen, delivering a cheaper and safer ride that it says is more user friendly. Nissan’s system shares its fundamental technology with the traditional fuel cell systems in such vehicles as the Toyota Mirai or Honda Clarity fuel cell sedans. It even requires hydrogen to be fed through its fuel stack to generate electricity. And like those existing vehicles, it uses that electricity to power an electric motor that drivers the car. Excess electricity is also stored in an onboard battery. But the biggest difference is that Nissan’s system generates its hydrogen inside the car. It does so through an additional step handled by a component called the reformer. The reformer transforms ethanol in the fuel tank into hydrogen, which is then fed into in the fuel stack. In a traditional hydrogen fuel cell car, there is no reformer. The car’s fuel tank carries pressurized hydrogen pumped directly from a fueling station. Nissan says its system has several advantages, despite the extra step. First, ethanol fuel is much more widely available than hydrogen, making it easier to introduce the drivetrain technology. It also doesn’t require a special fueling station. Indeed, countries such as Brazil already widely use ethanol fuel. Second, ethanol is safer to use than hydrogen because it is not as combustible. Also, Nissan’s system operates at a much higher temperature. That means it doesn’t need pricey precious metals as catalysts. Low priced metals will do. Costs are further reduced because the fuel tank is not a high-tech carbon fiber pressurized capsule. Finally, the fuel needn’t be pure ethanol. It can even be a mix of up to 55 percent water, which further brings down the cost of the operation. On the flip side, Nissan said it needs to improve the system’s heat management because swings from hot to cold extremes put pressure on durability. And because it works best at high temperatures, driving response lags until the system heats up. Also, traditional fuel cell cars are zero emissions; that is, they emit only water vapor and heat. Nissan’s system emits water vapor, heat and carbon dioxide. That is because carbon dioxide is a byproduct of the onboard reformation of ethanol into hydrogen. 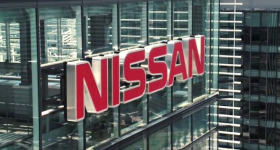 Nissan argues, however, that the system is “carbon neutral” when counted wheel-to-well. That is because carbon dioxide released is eventually sequestered in the crops that are harvested to make the ethanol. So carbon is contained in a closed loop. Despite developing the new technology, Nissan said it hasn’t given up on traditional hydrogen fuel cell systems. Indeed, it will continue to develop that technology in parallel with its partners Daimler AG of Germany and Ford Motor Co.